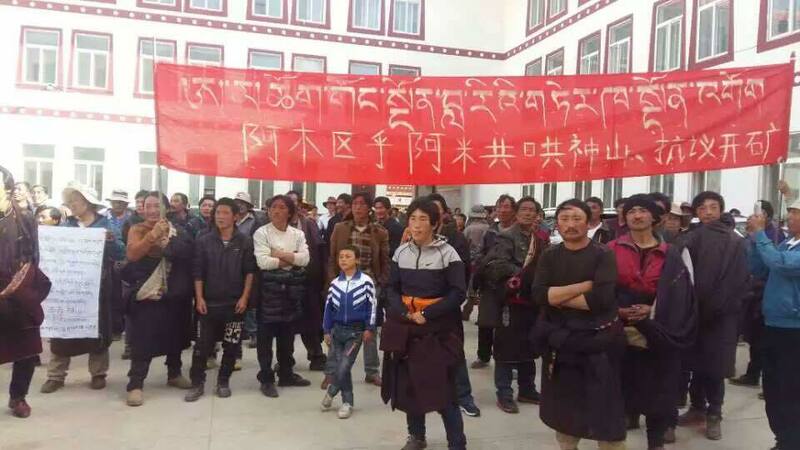 (TibetanReview.net, Jun09, 2016) – At least seven Tibetan villagers were detained in Amchok Town of Sangchu (Chinese: Xiahe) County in Gansu Province after hundreds of them staged five days of protests against mining on their sacred mountain, reported SCMP.com Jun 8, citing a source familiar with the matter. It said photographs taken by local villagers showed protesters holding banners with Tibetan slogans in the mountainous area, plus gathering at a mine site, marching down a town street and sitting outside the local government building. The report added that a large number of policemen, including paramilitary police, were deployed to contain the protesters. It said seven of the main protest leaders were seized, among whom two were beaten by the police during arrest and suffered relatively serious injuries. The protests were reported to have begun on May 31. The report said all the seven protesters had been released on Jun 5, with the demonstrators having dispersed. However, a heavy police presence remained in the town. Earlier, the Tibetan Service of Radio Free Asia (RFA, Washington) suggested Jun 6 that the beating and detentions took place on Jun 1and that one of the injured had to be rushed to a hospital in the provincial capital Chengdu. The report suggested that the Tibetans initially gathered at Khelpa village in Amchok Township when a large body of Chinese People’s Armed Police Force arrived on the scene and there were arguments and later clashes between the two sides, leading to the beating and detentions. The report continued that residents of Amchok’s eight villages later gathered on an open area on Jun 4 to hold an incense-leaf burning ceremony and to continue their protest against the mining on the sacred Gong Ngon Lari mountain. Many paramilitary police arrived and surrounded the Tibetan villagers, leading to a tense standoff. However, on the advice of senior religious figures who were present, the Tibetans abandoned their protest, the report added. The SCMP.com report cited the villagers as saying that some local gold miners had been operating on the township’s highest and sacred mountain illegally under the blind eye of the local government, severely damaging the environment and creating conflict with local residents. However, the SCMP.com report cited a notice issued by the local government on Jun 3 and circulated on the internet as blaming the protests on a few ill-intended individuals who had “colluded” with “overseas anti-China forces”. “A few people with an evil agenda have planned and organised some members of the masses who are unaware of the truth in the name of protecting the sacred mountain and the environment,” the notice was quoted as saying. “[They] illegally gathered about a hundred people to disturb the regular production of the Nahedi gold mine many times and collided with overseas anti-China forces to distort the truth and create much hype, causing a baneful influence and serious consequences,” it was further quoted as saying. The reports said the protest at Amchok Township, with a population of 25,000 and located about 80km south of the town centre Xiahe, had begun on May 31 following 15 years of frustrated appeals to authorities to halt the mining on the mountain which was sacred to the township’s cluster of eight villages.